The most common spelling of the name today is Landis, but not so in years past. Many Germans in eastern Pennsylvania used the spelling Landes during the 18th and 19th centuries. Christian Hege, in his article on the family in the Mennonite Encyclopedia (1955), suggested that Landis was the original Swiss spelling, used by families who migrated more directly from Switzerland to America, while those who came through Germany used the modified spelling Landes. This may be more or less true. Locally, the spelling Landes was largely forsaken as Germans moved to English language in the late 19th and 20th centuries. In a few families, the “es” spelling was retained and passed down to descendants who have spread throughout the area. At least ten men of this name came to eastern Pennsylvania during the colonial period; another eleven settled in Lancaster and York counties. Like Moyer/Myers, this is one of the most common surnames among Pennsylvania Mennonites. Virtually everyone descended from this community is part of the Landis family. Abram A. Landis farm, Lower Salford Township, 1961. Photo by Pete Macinskas. Mennonite Heritage Center, Macinskas Slide Collection (Hist. Mss. 557). Gift of Leon Z. Moyer. The Mennonite Landis’s who came to Pennsylvania were descendants of Hans and Katharina Schinz Landis, who lived at Hirzel, Switzerland in the 16th century. One of their sons, Hans Landis the preacher, was the last Anabaptist to be executed by Swiss authorities in 1614. Only one Pennsylvania immigrant was likely his descendant, Felix Landis of Lancaster (immigrated 1717). Most of the Pennsylvania immigrants are believed to descend from the martyr’s brother, Rudolph Landis. Several of the immigrants who settled in Bucks County were brothers, at least Abraham (d. 1791) and Rudolph (1732-1802). They arrived together on the ship “Isaac” in 1749 and both bought land in Bedminster Township. Ten years later Abraham was chosen as one of the first Mennonite preachers at Deep Run, and Rudolph was made deacon. Rudolph is remembered for an acrostic spiritual poem he wrote based on the letters of his name. It was later copied out in fraktur by his grandson and namesake Rudolph Landes (see below) in two pieces dated February 1814. The first half (acrostic R-H) is in the collection of the Free Library of Philadelphia (view it here with translation); the second half (L-S) was made two weeks later and is in the collection of the Henry Ford Museum (view here). Immigrant Rudolph is remembered as a woodworker. His brace and bits, inscribed “1770 R.L.” are in the Mennonite Heritage Center collection and currently on display in the Work and Hope exhibit. We also hold a spinning wheel probably made by Rudolph Landes, inscribed “R.L. 1787”. In Philadelphia County (now Montgomery County), there were two immigrants named Jacob Landes who settled at Franconia and Salford. They were probably close relatives of the Bucks County Landes’s. In the 20th century a monument was erected for them at Delp’s Cemetery near Harleysville. The side facing Franconia Township is marked in memory of Jacob Landes (d. 1749) and son Jacob (d. 1793) “Franconia line”, and the side facing Salford marked Jacob Landes (d. 1777) and son John (d. 1803) “Salford line”. From Jacob of Franconia came a multitude of descendants, one of whom founded a grocery business that has developed into a small chain of supermarkets spread from Perkasie to Pottstown. Frank M. Landis (1911-1977), a member of Franconia Mennonite Church, opened a grocery store in Telford Borough in 1938. Forty years later, his children expanded to a supermarket, and later opened markets in Perkasie, Schwenksville, Vernfield, and most recently Sanatoga. Landis Supermarkets continues to be family-owned, and is a great place to find local products and excellent baked goods. In fact, Harleysville Hank goes to Landis to get his Bauman’s applebutter. Video by MHC Advancement Director and Harleysville Hank dignitary Steve Diehl. The MHC collection contains a great selection of fraktur made for or by Landis family members over the years. The earliest piece is this family register made for Jacob and Agnes Fretz Landes of Hilltown Township by schoolmaster John Adam Eyer, circa 1783. It unfortunately has condition issues, being cropped and torn around the edges, but Eyer’s beautiful red and green colors are still vibrant after 225 years. Another early piece is a Vorschrift (writing model) made by an unknown schoolmaster in 1801 for Magdalena Landes of Bedminster Township. 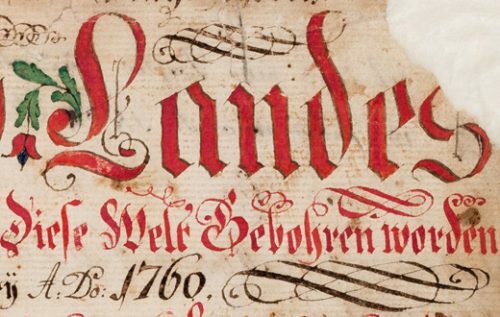 Magdalena never married and the fraktur passed down in the family of her brother, my ancestor Isaac Landes. In the 1970s, my grandfather Milton Keeler, himself a calligrapher, discovered it rolled up in the till of an old blanket chest from my grandmother’s family. Thankfully, he donated it to the MHC so it could be preserved and shared here. A Bucks County artist of the early 19th century was Rudolph Landes, or Ralph Landis as his gravestone reads. He was born in 1789, and died and was buried at Deep Run in 1852. Though his style was less refined than some contemporaries, he employed rich imagery. Of his work, the MHC collection includes the spiritual drawing and family register shown here, and a manuscript tunebook. Moving to Montgomery County, in 1829 the colorful bookplate below was made by John M. Landes (1811-1852) for his ciphering book. Unusually, the plate combines Pennsylvania German motifs with English script writing. John was probably a young schoolteacher, though his English spelling is quite poor: “This Book is the Proberty to John Landes In Opersolfot Township Montgomry County State of Pennsylvania. I Rott that in the year of our lort, one thousend eight hundret and twenty nine, th 1 of April th 1” and inside the heart a charming poem in phonetic spelling: “This Book is mine if you will know, by letters Tow [two] I will you Show; the first is J, a latter bride [letter bright], the next is L, in all mans side [sight], and if you chance to spell a miss, look under knees [underneath] and thar it is.” The cover of the book bears an interesting silhouette, probably from the time of the plate (circa 1830), but with arm, legs, hat, beard and cigar added later in pencil by a creative and probably bored child. Gift of Hiram & Mary Jane Lederach Hershey (1999.11.9). The birds and branches from this bookplate were used as the Mennonite Heritage Center logo from 1973 to 1992. Before she died at the age of 94, Sally Landis had 217 descendants, whom she could name in order, and whose voices she could recognize, though she was physically blind at the end. According to Kulp, “her philosophy of life was a beautiful and inspiring one. Speaking of such as had hurt her deeply during her life she said, ‘Mir kann net immer mit geh mit was die Leit duhne, awer mir muss doch ihre Seele liewe.’ (One cannot always condone what people do, but we must still love their souls).” (Heckler Plains: A Magazine of Community Life, 1977, p45). Kulp recorded some of his conversations with Sally (mostly in Pennsylvania Dutch), and the tapes are preserved in the Kulp Collection at the MHC. Listen here to a clip of Sally singing in English and German. There are many artifacts that could be shown, and many stories to tell if time and space allowed—such as that of Susan Landis Ruth (1909-2005) whose life was documented by granddaughter Dawn Nelson in her book A Mennonite Woman: Exploring Spiritual Life and Identity (2010); or the collection of clothing and textiles that belonged to Sarah Landis Shelly (1856-1900) of Quakertown. For now, I’ll close by sharing a few items in the collection that represent the Landes’s who preserved the “e” spelling of the name. Jacob M. Landes (1816-1906), a farmer of Salford Township, designed and patented a horse-drawn convertible harrow-cultivator in 1886. The implement was produced and sold to local farmers, and we have one in the MHC farm equipment collection that was used in Franconia Township. We’re also fortunate to have the scale model that belonged to J. M. Landes himself, along with the patent papers. Left: Full-size Landes cultivator. Gift of Cyrus H. Landes (1978.5.1). Right: Scale model and patent application. Gift of the family of Jacob F. Landes, grandson of Jacob M. Landes (1975.105.1-2). Another Jacob Landes – Jacob H. (1898-1982) of Souderton – made the heartwarming needlework below at age 81 for a great-grandson. Jake was a man of varied interests. During his career, he owned and operated the creamery in Skippack Township for which the village of Creamery was named. Some people called him “Butter Man Jake”. Later he moved to near Souderton and operated a fox farm, breeding silver foxes for their pelts (which is not particularly heartwarming). He is remembered as a song leader whose voice could be heard throughout the large Franconia meetinghouse. In final years, he enjoyed “working on bikes”, according to the church directory, and apparently also cross-stitch, a hobby likely picked up from wife Mae, an enthusiastic needleworker. Jake’s mother made a beautiful, homey quilt that is one of my favorites in the MHC collection. Lizzie Hagey Landes (1870-1949) resided in Harleysville, where she made this “Grandmother’s Flower Garden” quilt in the early 1940s. Amsler, Cory M. “Rudolph Landes.” Bucks County Fraktur. Doylestown, PA: Historical Society of Bucks County. 2001. pp. 275-276. Crawford, Ruth P. Descendants of Abraham Landes & Magdalena Oberholtzer Landes of Bedminster Twp., Bucks Co. Independence, MO: Unpublished. 1955. Available in the MHC library. Jahnsen, Henrietta Moyer Landis. Ascendants and Descendants of Ephraim Rosenberger Landes. Quakertown, PA: Self-published. 1987. Landes, Henry S. Descendants of Jacob Landes of Salford Township, Montgomery Co., Pennsylvania. Souderton, PA: Self-published. 1943. Available in the MHC library. Landes, Henry S. Landis-Landes Family: Descendants of Jacob Landes who settled in Franconia Township and died in 1749. Harleysville, PA: Mennonite Historians of Eastern Pennsylvania. .
Landis-Landes Family Reunion Reports, 1911-1950s. Available in the MHC library, with name index by genealogist Helen Urbanchuk. Nelson, Dawn Ruth. A Mennonite Woman: Exploring Spiritual Life and Identity. Telford, PA: Cascadia. 2010. Biography of Susan Landis Ruth. Wenger, Samuel E. A Combined Landis/Landes Genealogy Report of the Descendants of Hans Landis and Katharina Schinz. Akron, PA: Self-published. 2005.
through sons and grandsons came to NY then PA, Buck’s County. I have a Fretz Family History book ( 600 pages) that mentions well over a hundred of the Landis’ family members and how they were connected to the Rittenhouse/Fretz family. Thank you ever so much for this! I am a descendent of Jacob of Franconia. I must be a descendant of Jacob of Franconia. My last name is e and I don’t know what led me to look this up but it was so interesting to read! I want to make a trip sometime to this place see everything for myself!